redlogix ASTRO.control is a dedicated platform for control of astronomical instrumentation, and in particular high-end scientific cameras. 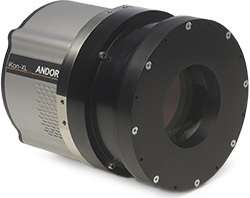 Most Andor CCD & EMCCD cameras for astronomy applications are supported out of the box, including the iXon Ultra 888 and 897 EMCCD cameras, the popular iKon-L 936 4.2 megapixel back-illuminated CCD, as well as the new and exciting iKon XL very large area back-illuminated CCD platform. ASTRO.control systems are based on industry grade IPCs, robust enough for the environmental conditions of an observatory. The boxes run a sophisticated Real-time & Embedded Linux operating system. Supported device classes include cameras, filter wheels, focusers, telescope mounts, domes and more. Framework software and application modules are pre-installed, providing a high-level platform on which custom specific astronomy applications can be implemented. Basic functions for camera control, image acquisition, image calibration and processing, local storage in FITS format, image transfer via Ethernet and communication via INDI protocol and the ASCOM interface are available out of the box. Remote Camera Control, networking Cameras with USB or PCIe connections can be connected to a mini ASTRO controller which forwards camera control and image transfer to Ethernet, thus enabling cameras on the network. Instrument control An instrument for e.g. observation, guiding, or adaptive optics, which includes a camera plus related devices, like filter wheels or focusers, can be managed by only one control box. Multiple camera control Multiple cameras can be managed by one control box, including processing their parallel image streams. Custom software development services and turn-key solutions around Andor cameras enhance the value and shorten the time to get a camera integrated and operative in a given environment. Redlogix has much experience with custom solutions in scientific and industrial areas and provides such professional software services, e.g. specific camera control software, graphical user interfaces, network image transfer or integration with existing software. Operating systems Windows, Linux, MacOS and Android are supported. See http://www.astrocontrol.de/en/services for more details.